Hosting is the most important part of your website. By now we all know what hosting means and there are a variety of hosting plans most commonly being Shared hosting, VPS hosting and Dedicated hosting. You have to make sure that you choose the right hosting plans according to your use and business. Hosting plans can influence your websites earnings and traffic. The aim of today’s article is to know the difference between Shared hosting and WordPress hosting. Shared hosting means many websites are hosted on one physical server. This is the most common type of hosting that is used by start-ups and small business. The Ram, CPU, etc. are on sharing basis, therefore the name “shared”. Whereas, WordPress hosting, as the name suggests, is specially designed and optimized for WordPress websites. Let us look at some points that differentiate the two. In shared hosting, everything is on sharing basis and there are many websites on one server, therefore it is the cheapest of all the hosting plans available. WordPress hosting, of course, comes with a higher price tag since it serves to a very specific market. Higher the price of WordPress hosting, it will allow high traffic and if you have a large business, then investing in WordPress hosting is not a big deal. You will suffer downtime on shared hosting server since it is on sharing basis. There are chances that you might have a bad neighbor and it might influence the performance of your website. You cannot use a greater portion of resources because there are other websites sharing it. WordPress hosting allows sharing but there are comparatively fewer websites sharing and sometimes none. Therefore, you get to use a greater portion of resources for your website, which in turn reduces downtime. There are very fewer chances of your website going down and there will be maximum uptime. WordPress hosting gives more attention to individual security and they take security very seriously. And in case your website gets hacked, they have a great support team and helps. It takes security to a completely new level. On most WordPress hosting plans, there are increased security protocols, malware scans, and many features to solve all kinds of cyber threats. Shared hosting has higher risks of being attacked by hackers and malware since there are many websites on one server. Shared hosting also takes security seriously but compared to WordPress hosting, security is less. It is extremely important to make regular backups of your website. Many WordPress hosting plans have automated daily backup features and it also helps to quickly and easily restore your backups with one click. In case of shared hosting, many of them do not offer automated backup features. It usually offers internal backups that have great risks of losing original files if the main data center goes down. 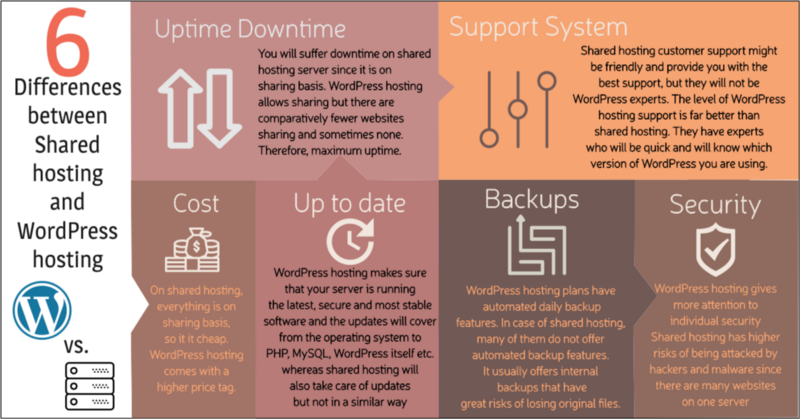 The goals of WordPress hosting and shared hosting are different. WordPress hosting wants to keep you and your website happy whereas, shared hosting wants to keep everyone and all websites happy on one server. Therefore, WordPress hosting makes sure that your server is running the latest, secure and most stable software and the updates will cover from the operating system to PHP, MySQL, WordPress itself etc. whereas shared hosting will also take care of updates but not in a similar way. It will focus more on maintaining server needs and operating system and will not include WordPress. Shared hosting customer support might be friendly and provide you with the best support, but they will not be WordPress experts. The level of WordPress hosting support is far better than shared hosting. They have experts who will be quick and will know which version of WordPress you are using and what plugins are installed. They will solve issues better which shared hosting support won’t be able to do. You might have a better idea by now of the difference between shared hosting and WordPress hosting. If you are financially better and your business is performing better then it is the time that you move away from shared hosting. It does have its own advantages and it all depends on the kind of business you are running and also on your budget.